FILMMAKERS HAVE SCOURED the globe to feature big cities, small towns, churches, shopping centers, and natural wonders in their movies. There’s a reason they picked these places, and both film buff and travelers will enjoy finding out why. Orson Welles delivered his famously cynical monologue about how the Swiss invented cuckoo clocks (which is actually untrue — the clocks originated in Germany), underneath the pleasant backdrop of Prater Amusement Park’s ferris wheel. The noir film takes place in Vienna, where many of its exterior scenes were shot on location, a rarity for the industry in 1949. 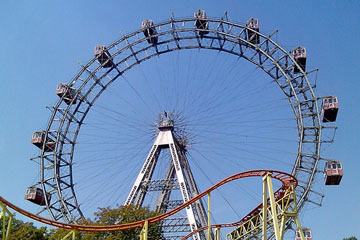 The Prater Amusement Park is still around today, ferris wheel intact. Alfred Hitchcock’s classic mystery is practically an ode to the beautiful and varying landscape of San Francisco. The “master of suspense” filmed several movies in and around the foggy city. Vertigo showcases many historic landmarks including Mission Dolores, the Legion of Honor Museum, and — perhaps most notably — Fort Point by the Golden Gate Bridge in a pivotal scene. Hitchcock said he often used Coit Tower in the background as a phallic symbol. The Park Hyatt in Tokyo served as the hotel for Bill Murray and Scarlett Johansson in the film. The New York Bar, situated on the 52nd floor, is featured in the movie, and you can order a “Sofia” cocktail here in honor of the Lost in Translation director. All other locations and businesses mentioned throughout the movie are real and can be found using a map in the Japanese-edition DVD. Robert Altman’s interpretation of the 1930s comic strip bombed at the box office but at least the movie’s set proved to be a hit with tourists. The Mediterranean island of Malta was chosen to be the fictional sailor’s community due to its proximity to water and open space for construction. 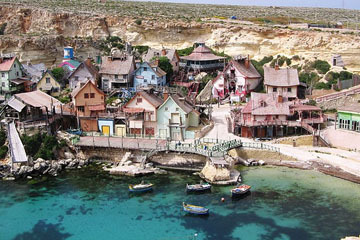 The set, made up of a manmade breakwater and ramshackle houses, was named “Popeye Village” after production wrapped, and was turned into a mini-theme park. Geared toward families, there are shows and boat rides daily. You can even get your picture taken with Popeye and Olive Oyl. The Trevi Fountain was already one of the most popular tourist destinations in Rome, and it was made even more iconic due to the images of Italian film star Marcello Mastroianni and Swedish model Anita Ekberg frolicking in the water late at night. It is estimated that visitors toss more than 3,000 € in coins into the fountain each day. You can’t have Breakfast at Tiffany’s without the Tiffany’s. Luckily, director Blake Edwards received permission from the legendary jewelry house to shoot several interior scenes inside the Manhattan flagship store, as well as the famous opening sequence outside the storefront with an elegant Audrey Hepburn nibbling on pastries. Tatooine isn’t really part of a galaxy far, far away. The scenes featuring Luke Skywalker’s home planet were actually filmed in the Tunisian desert. 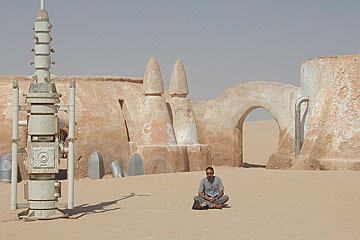 Skywalker’s house was shot at the Hotel Sidi Driss, a traditional troglodytic underground building in Matmata. Many of the original set pieces built by director George Lucas’s crew remain in the hotel today. A bronze statue created for Rocky III can now be found at the bottom of the steps outside of the museum. There’s actually art in the Philadelphia Museum of Art, so check that out too! Several tour companies in England have capitalized on the success of the Harry Potter film franchise, offering fans the chance to see locations used in the series. You can do it on your own, though. In Oxford, take a trip to Christ Church College at Oxford University which stood in as the Hogwarts Great Hall (with the help of some digital enhancement). The Gloucester Cathedral in Gloucester was used for other interior shots at Hogwarts. In Yorskshire, The Goathland Rail Station served as the Hogsmeade Station for Harry’s fellow students of wizardry. These are just a few suggestions for you Potter-philes out there. Like Harry Potter, the Lord of the Rings movie series has spawned many specialized tours for fans to see the vast, lush Middle Earth. 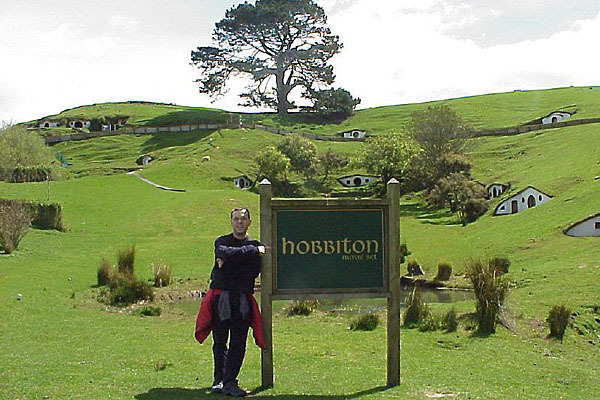 New Zealand’s Department of Conservation has compiled a list of locations used in the films along with scene details and their GPS coordinates, making it easy for you to see the cinematic land of the Hobbits without the aid of a tour company. If you’re into movies, you’ll enjoy these two philosophical pieces: The Travel Wisdom of Bruce Lee and What Tyler Durden’s Philosophy Teaches Us About Travel.